Did you see DailyKos.com diarist TocqueDeville's latest post, the one where he gushes over Patrick Byrne's theories on short selling of stock? Reading that post was as hilarous as watching MSNBC quote Martin Eisenstadt last year. Remember Eisenstadt? The alleged McCain campaign staffer who said Sarah Palin is so clueless, she doesn't even know that Africa is a continent? MSNBC producers broadcast the story, humiliated Palin, and then choked on their words when they learned what many of us had known for months: Martin Eisenstadt does not exist. He is a hoax perpetrated by two mischievous California filmmakers. Well, that's essentially what happened last week on the popular blog DailyKos.com when one of its diarists repeated Patrick Byrne's tall tale hook, line, and stinker. Their unanimous conclusion? Short selling is a controversial practice, but it's not the reason Overstock.com is struggling. "Blaming short sellers is an old and inartful dodge," explained economic strategist Barry Ritholtz. Byrne should have been satisfied to be a legitimate part of a national discussion about a questionable Wall St. practice. Instead, the colorful CEO conducted a bogus smear campaign to discredit the reporters who discounted his theories. "It has always seemed to me that Mr. Byrne's primary mission had less to do with the supposed evils of naked short sellers, and more to do with making life miserable for anyone who dared to criticize his company," said New York Times columnist Joe Nocera. In a misguided attempt to bury his critics, Byrne paid people to post comments on Internet message boards using false identities and false information -- a practice known as sock puppeting, one of the dark arts of the Internet. Blogger William K. Wolfrum learned a lot about sock puppeting while uncovering the Eisenstadt Hoax story, so did filmmaker and legendary hoaxter Dan Mirvish, who together with Eitan Gorlin invented the fake Eisenstadt character for satirical purposes. Wolfrum, Mirvish, and I compared notes for this post as well as for Wolfrum's amazingly detailed report on the mad, mad world of Patrick Byrne, which you can read here. Mirvish told The Huffington Post he's impressed by how much time and effort Byrne put into his defamatory sock puppertry, although Team Byrne was sloppy. "I'm struck by their repeated efforts to try sock puppeting Wikipedia, which is notoriously rigorous. Wikipedia administrators can easily see which sock puppets come from the same IP address," said Mirvish. To be fair, TocqueDeville at DailyKos isn't the first writer to fall for a media-based hoax. (Even the award-winning L.A. Times fell for the Eisenstadt ruse.) And Patrick Byrne isn't the only CEO brazen enough to resort to sock puppetry. (Whole Foods CEO John Mackey was caught making pseudonymous posts on financial message boards.) We could try and imagine how much disinformation is creeping through the Internet, but we'd probably never stop throwing up. It's not just the stock market we should be worried about. A democracy requires lively conversation and depends on a free press to inform our dialogue. With newspapers fading away like buggy whips, will it be left to bloggers to put events into context? If so, how will readers discern which bloggers are credible? Time for Internet truth squads? Internet journalism is revolutionary in some ways, but in others it's reminiscent of the bygone days of pamphleteering. To live up to its promise, Internet reporting must get better, and it will. Meanwhile, hacks like Byrne threaten to ruin online journalism for the rest of us. Maybe it's time to stand up for what the Internet can be. Somehow we ought to shore up the islands of journalistic credibility that are emerging, and marginalize the disinformation Web sites. Wolfrum and I are experimenting with that concept today by linking to each other, as well as to the earlier investigative efforts of Eisinger, Greenberg, McLean, Nocera, Remond, and Weiss. Truth will out. Ten years ago it didn't make sense for media outlets to collaborate on a story, but today it might. The crucial battle isn't between journalists and bloggers, it's between journalists (both old and new media) and the growing number of Internet spammers -- like Patrick Byrne -- who are trying to hijack the news business. UPDATE 4.29.09: For years, Patrick Byrne has been invited to prove that naked short selling (which is illegal) damaged his company -- or any company for that matter. He finally put together a little slide show. Forensic accountant Tracy Coenen looked at the presentation and concluded, "Byrne's data proves nothing about naked short selling." Read Coenen's summary on Fraud Files. UPDATE 7.18.09: The truth squad doin' its thing. UPDATE 7.28.09: Heads up, real journalists. Fake journalist Patrick Byrne is using Spyware to get inside your computer. A DailyKos diarist caught Team Byrne red-handed. UPDATE 8.6.09: Convicted felon turned corporate whistle-blower Sam Antar believes Byrne's personal attacks on journalists are a sideshow to distract us from noticing that Overstock.com "is cookin' the books." Read Antar's continuing series of open letters to the Securities and Exchange Commission here, here, here, here, here, and here. 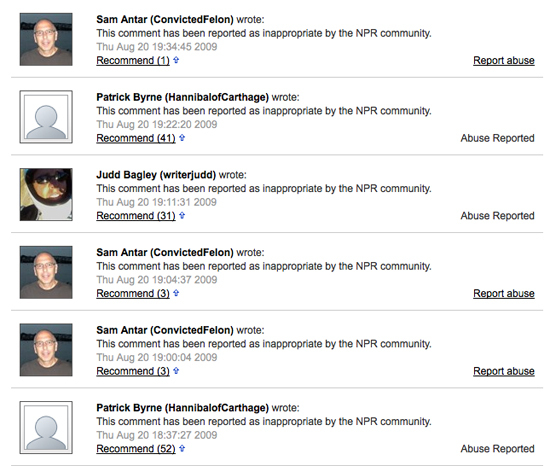 UPDATE 8.20.09: As soon as Sam Antar's spirited interview on National Public Radio was posted to the NPR Web site yesterday, Patrick Byrne's #1 paid cyberstalker Judd Bagley went to work to discredit the white collar crime fighter. As you can see by this amusing screen grab from today's Comments thread, NPR wisely deleted Byrne's attempt at character assassination. Welcome to the truth squad, NPR. UPDATE 9.17.09: Patrick Byrne has announced that his company, Overstock.com Inc. (OSTK.O), has been subpoenaed a second time by the SEC. UPDATE 10.23.09: Today Fox Business Channel featured Patrick Byrne as an expert on the SEC, but failed to mention that Byrne's company, Overstock.com, is currently being investigated by the SEC. On camera, Byrne claimed SEC officials are or were on the take. Who looked more sh*t-faced at the end of FBN's Happy Hour -- the network or Patrick Byrne? Our judges called it a split decision. UPDATE 11.16.09: In a move one might characterize as three steps from crazy, Overstock.com CEO Patrick Byrne has fired his company's auditors and filed an unaudited late Form 10-Q with the SEC. Crazy like a fox or just plain nuts? Read Byrne's reply here. (He quoted Nietzsche -- always a red flag.) Read fraud examiner Tracy Coenen's take here. UPDATE 11.23.09: Fired Overstock auditors Grant Thornton LLP said Patrick Byrne's mumbojumbo about them was "incorrect"... BTW, that's legalese for "Liar!" Read Grant Thornton's open letter to the SEC here. UPDATE 12.10.09: The truth squad grew to 7,483 members today when Patrick Byrne went all Richard Nixon and posted his enemies list online. Byrne's lengthy list included the children of journalists, until Barron's writer Bill Alpert shot off an email to the Overstock.com CEO about the unethical nature of including innocents on such a list. UPDATE 12.12.09: Byrne's #1 paid cyberstalker Judd Bagley has been caught red-handed using the assumed name "Larry Bergman" and stealing the photo identity of Vienna-based art critic Matthias Dusini in order to "friend" on Facebook nearly every journalist who ever wrote a negative word about Overstock.com. UPDATE 12.14.09: The phony "Larry Bergman" Facebook page has mysteriously disappeared. Surprised? Me neither. Here's Caleb Newquist at GoingConcern.com poking a little fun at the sophomoric Byrne. UPDATE 12.15.09: Popular investment blogger Barry Ritholtz has called for an FBI investigation and boycott of Overstock.com. UPDATE 12.18.09: Investigative journalist Gary Weiss has reported it was Facebook that deleted the fake "Larry Bergman" page. Facebook spokesman Simon Axten has issued a stern warning to Byrne and Bagley about their pretexting scheme. "It takes a special kind of douchebag to stalk the kids and spouses of your critics and adversaries," said Weiss, who is always a fun read. UPDATE 2.3.10: On his Google profile page, mad-as-a-hatter Judd Bagley has listed his superpower as "pattern finding." Not to be outdone, satirist William K. Wolfrum has proved that he, too, can spot patterns: there is a Judd problem in the U.S. these days. UPDATE 2.4.10: Shiver me timbers, those swashbuckling pirates at Overstock.com have announced they will be restating all quarterly financial reports from Q1 2008 to Q3 2009 because the existing reports violated any number of SEC disclosure rules. Turns out whistleblower Sam Antar was right: Overstock set up a cookie jar reserve to inflate future profits or, more strictly, to minimize future losses. UPDATE 3.24.10: The truth squad doin' its thing, which nine times out of ten means defending the honor of Herb Greenberg, an A-list financial journalist (and helluva nice guy) who has endured more of Byrne's hooey than you can imagine. UPDATE 5.25.10: Bryne apparently just dumped 140,000 shares -- or $3.2 million worth -- of OSTK stock. UPDATE 11.14.10: Overstock.com posted a stunningly dismal third quarter earnings report. UPDATE 11.18.10: California has filed suit against Overstock.com for $15 million, citing a pricing scam. UPDATE 12.20.10: Overstock.com has pulled the plug on a longstanding link to Byrne's "Deep Capture" smear sight, the former virtual home of cyberstalker Judd Bagley. UPDATE 2.23.11: Overstock became the second big retailer to be penalized by Google for artificially boosting their ranking on the Internet giant's search engine.